A Mansfield Town XI came from behind to earn a 1-1 draw in their pre-season friendly at Matlock Town on Tuesday night. The Stags side trailed to a first half wonder goal from Jordan Chappell until three minutes from time when Zayn Hakeem levelled matters at Causeway Lane. Hakeem was on loan at the Evo-Stik League Premier club at the beginning of last season and gave the home faithful a reminder of his abilities with the equaliser. The goal came after a late Matlock corner had broken down. Mansfield counter-attacked at pace and Hakeem outstripped a trialist before applying the finishing touch. It was the hosts who went ahead when former Sheffield United winger Chappell lifted an audacious chip over Sam Wilson after the Stags stopper had rushed out of goal to make a headed clearance. Paul Anderson warmed the palms of Gladiators keeper Richard Walton, while both Hakeem and Nyle Blake struck the same post in separate attacks. There were many changes at the break and into the second half, while Stags’ Keaton Ward was unlucky to see his 20-yard effort rebound off the woodwork. That chance came after a sustained period of pressure from the visitors who went on to create further opportunities against a youthful looking second half home side. But they only had Hakeem’s goal to show for their efforts in front of a crowd of 213 who had turned out for the midweek friendly in Derbyshire. 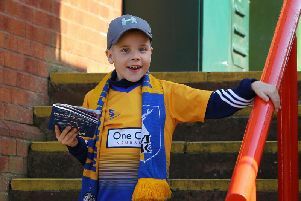 MANSFIELD TOWN: Sam Wilson, Aiden Walker, Henri Wilder, Keaton Ward, Cam Henley, Nyle Blake, Alistair Smith, Jordan Graham, Zeyn Hakeem, Paul Anderson. Subs: Warren Squires, Jack Connell, Harry Bircumshaw, Jordan Wells, Kane Baldwin, Jylorah Gooden. MATLOCK TOWN first half XI: Richard Walton, Jake Phillips, Jan Yeomans, Harry Vince, Dwayne Wiley, Adam Yates, Marcus Marshall, Jordan Chappell, Shaun Harrad, Ted Cribley, Kieren Watson. MATLOCK TOWN second half XI: Jordan Pierrepont, Trialist, Trialist, Trialist, Ashton Hall, Adam Yates (Trialist 66), Harry Wood, Trialist, Jamie Jackson, Trialist, Trialist.